Nothing helps pull together a set of outdoor chairs quite like an outdoor coffee table, and we've got plenty to choose from. Enjoy brands like Rustic Natural Cedar, Lexington, and more. Each of our outdoor coffee tables was built to withstand the elements without requiring a great deal of maintenance. Mix and match them with any of our outdoor chairs, sofas, loveseats or rocking chairs. Scroll down to shop our full selection of coffee tables and patio tables today. A great log-themed addition to any patio. Wonderful square log coffee table. 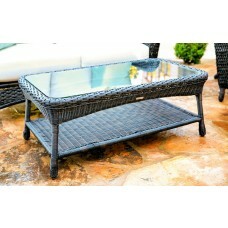 All weather wicker outdoor coffee table. Coffee tables provide a nice place to play a board game, to set a drink, or to enjoy a pretty centerpiece. They bring an outdoor room together, making it look finished and complete. That's why these patio side tables and coffee tables make such great choices for any back porch, deck, or back yard space. You can also use them on their own as decorative tables or other pieces. They make great gifts, too. Each coffee table comes with free shipping so that you can enjoy your table without the hassle. The northern white cedar tables are a particularly lovely choice, but we've also got POLYWOOD tables and synthetic wicker tables, each of which can withstand a variety of rough weather conditions. Scroll up and order your new outdoor coffee table today--you're not going to regret it! © 2017 TheRockingChairCompany.com All Rights Reserved.